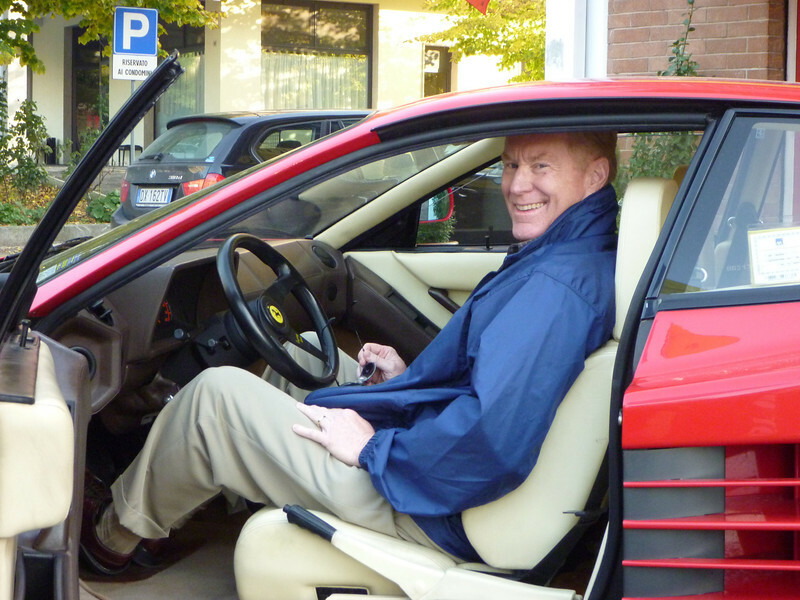 Alan’s ready to go on his Ferrari test drive in Maranello. Ferrari. In the world of all-things-automotive few other words conjure such vivid images: fast, expensive, pure Italian, the ultimate blend of man and machine. It was with these images in mind that I eagerly anticipated my boomer adventure on a Ferrari test drive. The setting was classic: an October late afternoon in Maranello, Italy, the same Maranello where the Ferrari factory, museum and Formula One facilities are located. Automotive mecca. 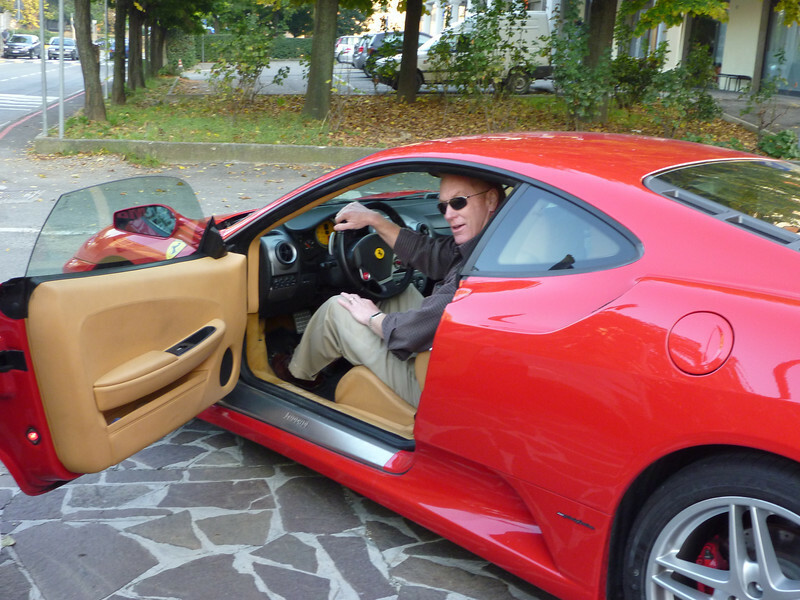 Our guide, Claudio Fontana of A La Carte Italy Tours, had arranged this event, knowing that I Love Maranello provides the ultimate Italian driving experience for car lovers. The machine is red, naturally, parked on the sidewalk, causing the pedestrians to detour closer to the street. It seems there are parking laws and then there are Ferrari laws. You get the picture. The obligatory photo op starts the session, then the invite to take my place behind the wheel. I slide in—one doesn’t sit in a Ferrari. Placing hands at the 3 o’clock-9 o’clock position, I make sure to convey to the co-pilot and any other observers that I am, in fact, in control. Where are my very expensive Italian driving gloves? In all the excitement I must have forgotten them. My biggest concern is the dreaded ‘let out the clutch and stall’ scenario. No problem, there is no clutch. 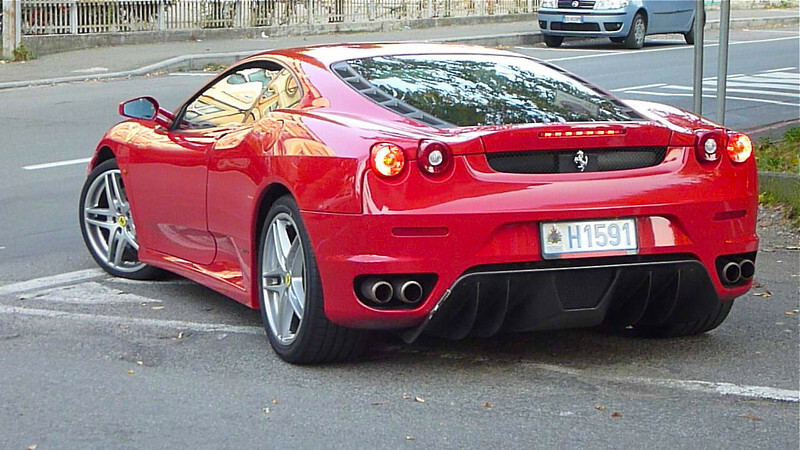 The Ferrari F430 model has sequential gears with paddle shifters on the steering wheel. My confidence building with each passing minute, I’m certain Ferrari Racing will quickly spot my talent and sign me to a multi-million dollar racing contract. Wow! And I haven’t even pulled onto the street yet. For the auto techno-types and baby boomer car buffs, the F430 runs a mid-engine dry sump, V8 rated 490 bhp at 8500 rpm. Impressive! Looking over to the passenger’s side, my non-English speaking co-pilot gives a slight nod for me to start the engine. I must point out, just starting a Ferrari engine is breathtaking, the quad cams controlling each of the 32 valves. Wonderful music. Okay, now we get serious as I tap the paddle to hit first gear. My 30 minutes of automotive stardom has begun. Pulling into traffic, I quickly debate doing a Mario Andretti and topping 150 kph in the first block, or being a bit more responsible and driving like a sane man. Reluctantly, the latter won out. So, into Italian traffic I go. Anyone been to Rome lately? Picture Roma traffic only on a slightly smaller scale. What were those forms I so eagerly signed before this drive started? I’m not sure as they were all in Italian. On purpose. Do you think they had something to do with an “if you wreck the Ferrari, we get your house” clause? Oh well, let it rip, we only go around once. Living in a tent might not be so bad, although I’m not sure Donna’s going to like it. The car (can you call a Ferrari a car?) is a dream, both in traffic and in more spirited driving. The sequential transmission shifts quickly and precisely-high praise, coming from me, a T-Rex dinosaur who believes that a true sports car has a clutch and shifter. Times change. The streets of Maranello are narrow and crowded but when one drives a red Ferrari the avenues seem to clear. An unwritten axiom exists in Ferrari Land—move over and get out of my way. And sure enough, as if by magic, the streets become less hectic. The three of us, yes, the Ferrari has now assumed a living, breathing status in my mind, wind our way through town. The small, outdoor cafes Italy is known for flash past, patrons, sipping their cappuccinos, quickly glance up with a knowing smile. The co-pilot merely grunts ‘left’ or ‘right’ as we follow his route. First gear, second gear and a little of third gear, the tach easily winds into the higher rpm range. Each shift is sharp and precise. Another grunt, another turn and we have arrived at the absolute center of the automotive universe—Avenue de Ferrari. The factory and Formula One facilities are located side by side. I slow the machine down slightly with a downshift to second, cruising along the buildings and letting it all soak in. After all, this may never happen again in my baby boomer lifetime. Another grunt, another turn and onto a four-lane expressway, the Italian equivalent to a beltline loop. This evokes an aggressive second gear acceleration, tap the paddle, hit third and remain pinned back in the seat. All too quickly another grunt signals a turn, downshift to second and an exit from the beltline. In another few moments, we’re back to the start line, my 30 minutes behind the wheel gone in what seems like five. Pulling up to the sidewalk, I find reverse and expertly park the red beauty. Perhaps if I hesitate before sliding out of my seat, they might invite me on another drive. But somehow the message doesn’t get across, the door opens and I’m standing there with a mile-wide grin. Wow, I gotta get me one of these! The Ferrari is returned in one piece. I get to keep the house and Donna won’t have to sleep in a tent, after all. I also get to keep memories of a baby boomer dream come true— a drive in the ultimate speed machine. A red one. Thinking about an Italian adventure? Start your planning at our Italy Travel Resources page. Have you visited Maranello, Italy? Did you experience a Ferrari test drive? Join the conversation at the My Itchy Travel Feet page on Facebook or send us an email to ask a question or share your experience.